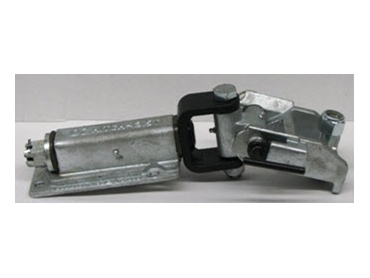 Now available from Manutec , the OZHITCH was designed to overcome general problems commonly found with hitches. Off-road hitches do not have an aligning tool guiding the halves together into a cradle, which makes them hard to use. They also have a pin from the top creating problems with centre mounted spare wheels and overhanging ute trays, and visually have a side on line of sight for connecting, rather than from above. Off-road hitches take a long time to align, are somewhat fiddly, have poor or difficult to use safety and locking mechanisms, require two hands to operate, and in a lot of cases have low operational angles. Buyers should also be aware that some hitches do not have ADR testing and approval. Manutec, however, has had the OZHITCH fully tested to exceed all Australian Standards. All off-road hitches must have an ADR Australian design rule stamp of approval. Manutec has ensured that the OZHITCH has all of the necessary approvals. Off-road hitches must be easy to connect. Be aware of small tolerances and fiddly parts that have a potential to jam or create difficulties when coated with mud or bull-dust. Small parts also damage much easier. Look for an off-road hitch that has two safety methods of securing the connecting pin in place. A lot of hitches just use a lynch pin to hold in the connecting pin, when there really should be some sort of backup safety device for securing the connecting pin in place and ensuring safety. This is the most important aspect after safety for an off-road hitch. Disconnecting your off-road hitch in a sandy or muddy situation to get un-bogged is a common occurrence, and as such one wants the hitch to be easy to reconnect. Some off-road hitches available give no room for error of any amount of misalignment while connecting. The OZHITCH has an aligning tool on the body that helps guide all the holes into alignment. When purchasing off-road hitches, there are some things that should be avoided. Avoid off-road tow hitches that do not have some type of nylon or urethane bushing in all major joints, especially the main rotational body on the trailer side. If the hitch does not have bushing the user will experience severe vibration. Inadequate bushing will wear very quickly in off-road conditions. Manutec has ensured that the bushing used in the OZHITCH is made from the highest quality self lubricating bushing material. Avoid tow hitches that have small parts and too many moving parts. The more functions the tow hitch has the less reliable it will be. Complicated off-road hitches cost more, complicate hitching up, have potential for problems, and are easy to damage. Be careful of buying an off-road hitch that does not have enough off-road angle ability. The standard tow ball hitch is inadequate. A true off-road hitch should have at least 45º of off-road angle. The OZHITCH is capable of coping with even the most challenging of off-road angles. Avoid an off-road hitch that has the pin load from the the top, as hitches that have connecting pins that load from the top have a handle sticking up that can limit off-road angles, prevent easy hitch up due to overhanging ute trays, and spare wheels being in the way. They will also fowl with barn doors and tail-gates. Just one misjudgement with one of these hitches will cost you way more in repairs to your car, than the cost of the right off-road hitch. The OZHITCH has the pin load from the side position. The OZHITCH was designed to overcome all of these above problems.